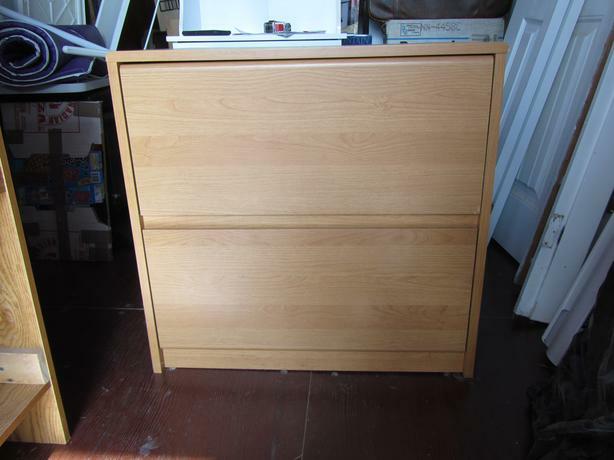 Nice looking 2 drawer wood finish filing cabinet. Measures 30" wide by 20" deep by 29" high. Double row forward facing letter files in each drawer. Drawers work vey smooth BUT...cabinet needs to be attached to a wall to prevent falling forward AND the two adjustable legs on the left side were ripped out while moving causing slight visible damage to the lower left side. Removing the two feet on the other side and/or adding felt pads under the sides would fix the problem. $40 obo. Delivery is available.